Love Island finalist Chris Hughes is training as a jockey to ride in a charity race at York this summer. Chris, who is already a rider and a racing fan, will be preparing under the watchful eye of top National Hunt trainer Jonjo O’Neill. “I would be lying if I said I didn’t fancy my chances,” said Chris, who found fame on the ITV show last year. Bookmaker Coral is sponsoring Chris, who is aiming to raise £20,000 by taking part in the Macmillan Ride of their Lives race on 16 June. “I love horse racing and grew up riding with my friends in Cheltenham,” added Chris. 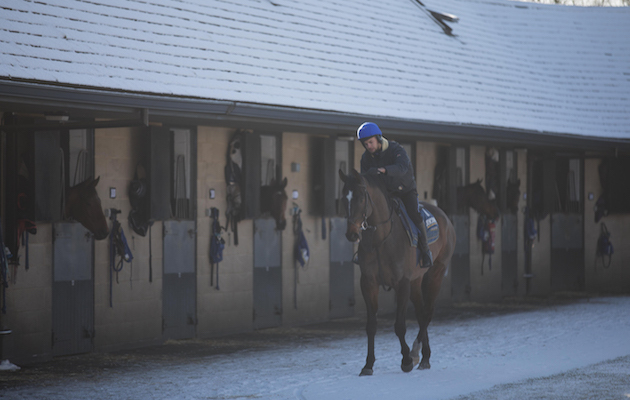 “I’m really excited about working with Coral and very grateful to Jonjo O’Neill for his support. “I always wanted to become a jockey as a kid, and Coral is helping make my dream come true. Chris joins top eventer and H&H blogger Matthew Wright as well as 10 other jockeys taking part in the race. Chris’s girlfriend Olivia Attwood, who also rides, has joined Coral as an ambassador, working on social media campaigns and taking part in public appearances for some of the major race meetings this year. “Chris always used to say when were on Love Island ‘I’m good at this, I’m good at that’ — [I said] well you can’t be good at everything,” said Olivia. Chris is undergoing months of intensive training at Jonjo’s base, Jackdaws Castle. “We have known Chris and his family for many years, and so naturally we are absolutely delighted to be supporting him as he prepares for his goal to become a jockey for the day,” said the Cheltenham Gold Cup-winning trainer, adding it is for a “brilliant cause”. Anthea Morshead, assistant clerk of the course at York, added this will be a “huge challenge” for the “dozen intrepid amateurs”. “Having met Chris I can see he is up for the challenge and already knows his way around a horse,” he added.